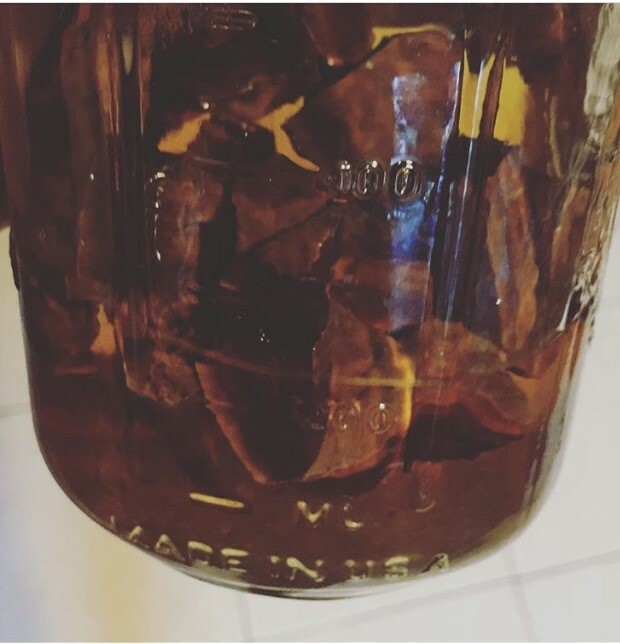 I wanted to try the double extraction based on the information I’ve read about making tinctures from mushrooms. 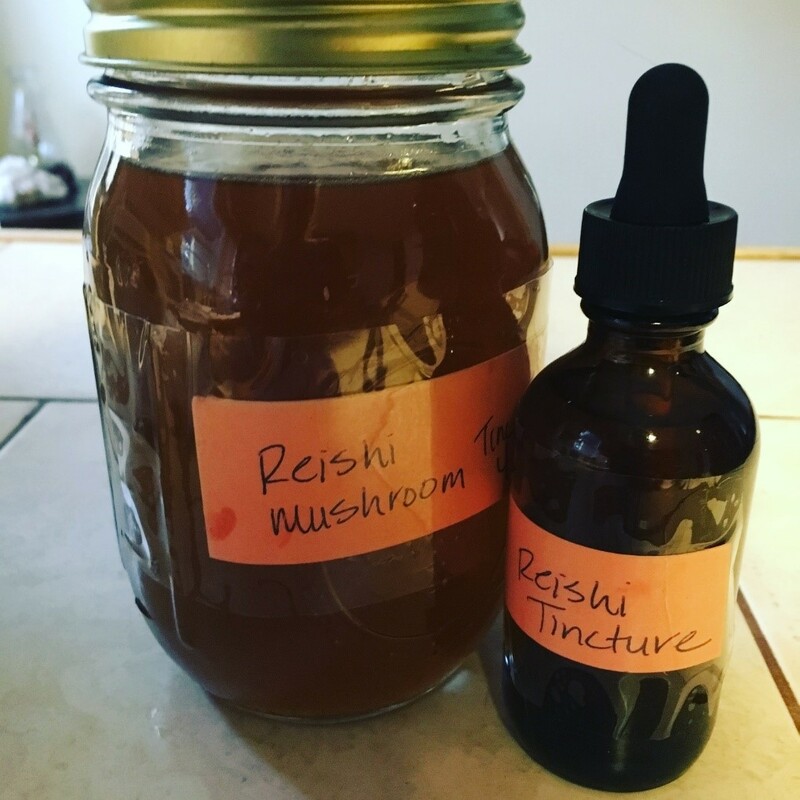 According to Mountain Rose Herbs, mushrooms like reishi contain some constituents that are water-soluble, called beta-glucans, and some that are alcohol-soluble, called triterpenes. A double extraction effectively pulls out both of these constituents without harming the shelf life of the tincture. 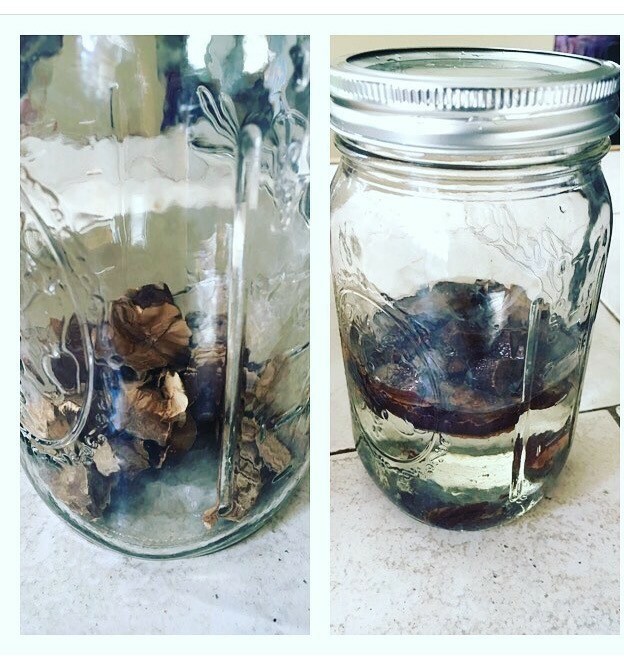 Fill a jar with dried reishi. 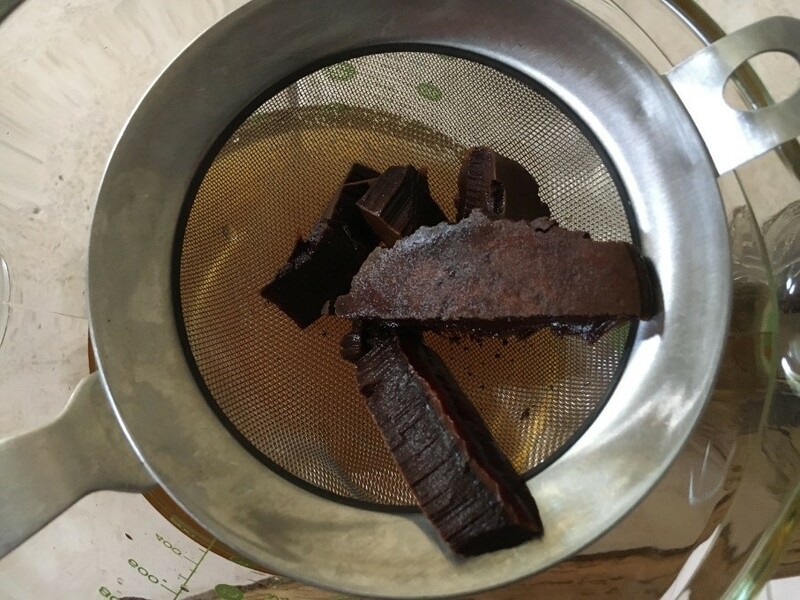 I had about two ounces of reishi – enough to cover the bottom of the jar. I had whole mushrooms which were incredibly difficult to break up into pieces. I would recommend looking for sources that provide slices of the mushroom to make life easier. Pour 2 cups of alcohol over the dried mushroom. I used 100 vodka. Make sure the alcohol completely covers the dried mushroom pieces. Place the jar in the pantry for at least two weeks. Try to shake it daily or every other day. Strain out the alcohol from the dried pieces of mushroom and set it aside. Put the marc in a pot and add water. I wanted to have the same amount of water as alcohol when finished boiling for an equal ratio of water to alcohol (as much as possible), so I added about four cups to the pot to begin boiling. Let this boil down to about 2 cups and cool. Be sure to keep an eye on the pot so that too much water doesn’t evaporate. Strain the water and pour the reishi alcohol into the water. I added two teaspoons of honey to sweeten the tincture. This made a lot of tincture! I put what I needed into an amber colored bottle with a dropper so that we can take small amounts every day. I have plenty to refill the bottle as needed. I also gave some to family members. Step One Illustration: Break or cut the dried reishi into small pieces. Add 2 cups of alcohol to cover. Step Two Illustration: Let the reishi/alcohol mixture set for at least 2 weeks. Be sure to show it lots of love during this time by shaking it to mix up the reishi with the alcohol. Step Three Illustration: Strain the reishi from the alcohol and put into a pan with about enough water to boil so that you’ll have 2 cups of water. Step Four illustration: After boiling, strain the marc once again. Dispose of the marc in your garden and thank it for its usefulness. When the water cools, add it to the alcohol tincture. I also added a bit (about a ½ tablespoon) of honey and then filled a bottle. The remaining tincture went into a jar for storage.